Ayurvedic Medicine represents the healing branch of yogic science, while Vedic astrology provides its understanding of time and karma. 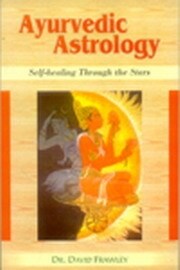 Ayurvedic astrology teaches the interface of these two extraordinary systems in the Vedic astrology of healing. The book explains how the different mind-body and planetary types of the two systems interrelate. It examines disease factors from an astrological perspective and goes in depth into astrological remedial measures, particularly gem therapy. It also contains many notable example charts.